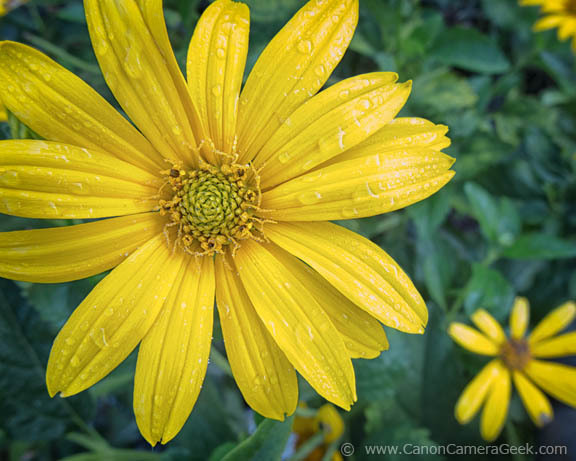 Here are a few sample images of macro photography with the Canon G1X Mark II. I included a very short video clip of the G1X Mark II at a macro distance from this same flower in the photo below. I've been playing around with Nik software and found that the Detail Extractor filter does a great job with macro images. I used that in all three of these macro images taken with the Mark II. In the photo below I also used the Vignette-Blur filter in Nik's Color Efex Pro 4 to soften the edges of the composition, placing more emphasis on the smaller petals in the center of the image. Close-ups like the one above are cropped from the original. Because the Mark II has a 1.5 inch sensor, you can crop quite a bit of the original images and still not have significant degradation of the image, and preventing you from printing them as small pieces of artwork. Sharpness is critical, both from focusing accurately as well as keeping the subject and camera perfectly still. I used the self-timer with all of these macro images and the Mark II. I never use the pop-up flash on the G1x Mark II. It's very useful in many situations, but definitely not for close-up photography. 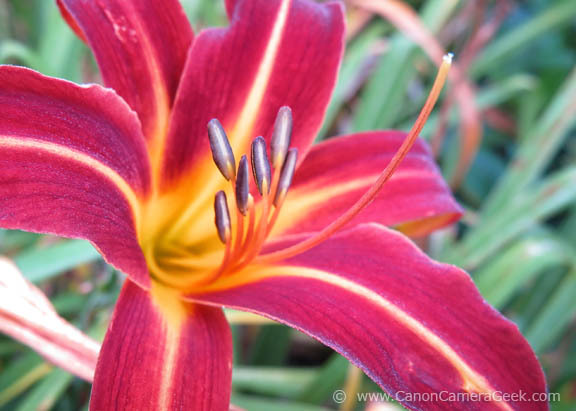 The G1X Mark II gets plenty close-enough for macro photography of flowers. It certainly can not duplicate the results of the super close macro shooting you achieve using DSLR cameras, dedicated macro lenses, bellows, or extension tubes. One of the nice advantages of using a small "point and shoot" type of camera like this one is that you can use a relatively light and portable tripod for support. I captures all of these images within an hour and also took quite a few with my 5D mark III equipped with extension tubes. 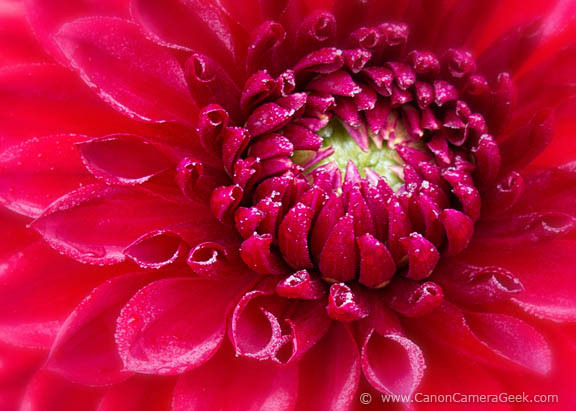 Here is a HD video sample of macro photography with the Canon G1X Mark II. The closest focusing distance with the lens, as is, on the Mark II is 5 cm, or about 2 inches. The shakiness is from the wind blowing and me bumping the tripod when I shot this short clip. Despite the wind noise from the little, built-in, condenser microphone, I like the quality of the HD video. Photography is supposed to be fun and I want to share that attitude with other people just like yourself. Can you share this page (or another of the Canon Camera Geek site) with someone? You can just click on one of the like buttons, like Pinterest or FaceBook, Twitter, or even Google+. It helps Google and other search engines know that this page is worthwhile visiting. 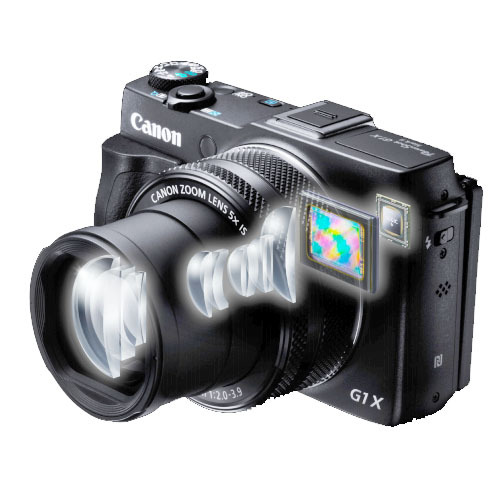 Have A Photo or a Comment About the G1X Mark II? The lens design of the Powershot G1X Mark II includes the ability to focus at only a distance of 2 inches form your subject.